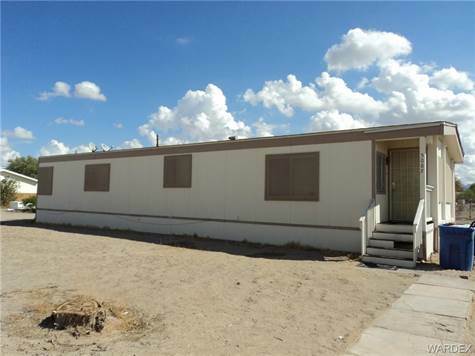 This is an excellent investment opportunity Roomy 2 Bdrm, 2 Bath Manufactured Home with solar screens & back patio, large open kitchen/dining/living area on 1.03 acre. Home has new AC as of 7/18, new Water Heater in 10/17, on septic system and private well, new pump motor 3 yrs ago. Single father of 3 young children is tenant, he is paying $650 @ month and in a lease until 10/31/19. Price has been reduced to offset some updating that could be done but home works perfectly for the tenant. Approx. 1/4 acre is fenced in back yard for tenant. Balance of acre could be easily subdivided to build another rental property or install additional manufactured home(s). Cost to subdivide is $800 with Mohave County, because this is a high rental area, there should not be any issues having it done for a better net profit for this property.